Ever since you can remember you have been told that multitasking is a skill you need to have in order to succeed in your career. Not only in your career though but in your life as well. If you were only able to focus on one thing at a time, everything you do everyday would likely take much more time to complete. Especially at work, we multitask all the time. We have one tab open looking at the results of this test and another tab open writing about the results. We move back and forth between tabs all day every day and never really think a thing about it. While we drive we talk on the phone or listen to music and exercise our ability to multitask (hopefully successfully.) However great that may be, it looks as though the more we multitask the harmful it is to our memory and our brain overall. Multitasking harmful to our brains? That’s what the new infographic from Online Universities shows us. Perhaps the most interesting and alarming fact on the graphic is that when we overwork our brain by multitasking to the extreme it starts to feel threatened. As a result, it shuts down brain regions that deal with empathy. At the same time, the more we multitask and switch from one thing to another, the more difficult it is for our brain to focus on one task at a time. Furthermore, the more we overwork our brain and multitask to the extreme, the more our memory, concentration and ability to make decisions and set goals is compromised. That’s why it’s best to take breaks, focus on one task or minimize the number of things we do at once to just two. That can be increasingly difficult to do though when 50 percent of internet users have more than 2.38 tabs open at once. To top that off, 25 percent of users have more than 3.59 tabs open at once. For internet users aged 26-35 years, the average number of tabs open at once is around five. That’s an awful lot of information to take in at once- especially when you are constantly going back and forth between tabs all day. It’s not all our fault, though. Work demands and the increase of media in our lives is very much at fault. In fact, in 1960 we only consumed about five hours of media a day. As of 2010, we consume an average of about 12 hours of media a day. That is a huge increase and our brains are feeling the effects. 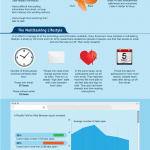 Take a look at the infographic for yourself and see how extreme multitasking is affecting your brain.